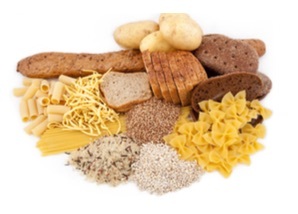 The focus for eating during exercise is on carbohydrates, especially sources of glucose and electrolytes. If exercise lasts longer than an hour, it is necessary to consume an additional 30 to 60 grams of carbohydrates per hour of activity. The focus during initial recovery is on carbohydrates, especially within 15 to 30 minutes after the activity, when cells are especially receptive to the uptake of glucose. During this time, athletes should consume 1.0 to 1.5 g/kg of a rapid-acting carbohydrate or a ratio of 4 grams of carbohydrate to 1 gram of protein (eg. low fat chocolate milk). After 30 minutes, the focus should be on a mixed meal with adequate carbohydrates, protein and fat.